Want to look like a million bucks without spending anywhere near that? Who doesn’t? The Guerilla Shopper has mastered the fine art of finding a great deal. Her Code Word column will decode where to shop, eat, and spend your hard earned dough – while keeping you out of debt. This Guerilla Shopper is in the trenches of New York City, now you can join her! It’s wedding season gals (or so I’ve heard)! Are you getting hitched? Are you the David’s Bridal or Vera Wang type? 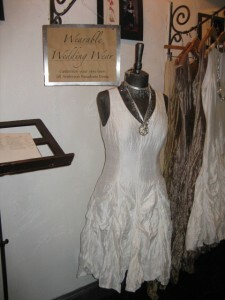 If you answered “yes” and “no” – in that order – you may want to check out Jill Anderson on E. 9th St.
Ms. Anderson offers “Wearable Wedding Wear” to those women who would probably be a bit more low key than perhaps the typical image of a bridezilla. One of the theories behind the customizable “Parachute Dress” (pictured here), is not so much that you should breakdance or skydive while wearing it, but more that you can and will wear it again. And maybe even again and again. Make it longer, shorter, fuller, lined, red, green, blueindigoviolet. It’s your big day dammit! Ms. Anderson’s shop also features various jewelry pieces. However, I think the jewelry from Ike Designs would be more appropriate for brides-to-be looking for something special to wear with their Wearable Wedding Wear. My advice would to be contact Dori O’Dea, the designer behind Ike, as her Web site only reveals a small portion of her delicately lovely wares. For more of Guerilla Shopper’s fashion faves click here. Do You Have Any Wedding Wear Ideas? Post a comment below and tell us!